I recently purchased a couple items of Cabela's outdoor clothing that I found on sale over the last few months. I'd already been looking at their line of "Microtex" clothing and had wanted to try it, as the ad in the catalogue makes it sound absolutely terrific. I'd also found that my two old camo bib overalls were getting a tad worn and that I needed to replace them with something new. Knowing how comfortable I'd found my first try at bibs for hunting wear, as my chosen pants, I decided to give a try to the "Silent Weave" bibs Cabela's carries as well. While perusing the ads/catalogue I also came across a light fleece vest and then finally a heavy vest made of their "Wooltimate" fabric that I'd wanted for some time and snatched both of them up on sale as well. So, a season when I felt I was already set up clothing-wise, turned out to be a new fall/winter wardrobe for Ed. We'll begin with my impression of the Microtex line. It is marketed as medium weight, tough clothing that resists tears and is "as tough as denim" and "as quiet as fleece," a tall order for any one item, I figured. Microtex clothing line. Illustration courtesy of Cabela's, Inc. So far, this clothing has lived up to it's billing being lightweight, but warm on cool days, and also being virtually noiseless and tough as well. An added bonus is that like many fleece products, these items do not wrinkle. No, I'm not meticulous about ironing my hunting garb, but I do like the idea of out of the washer, dry it outside to prevent odors, and then it dries wrinkle free. Wad it up in your pack or a box prepared to keep your items scent free and when it's pulled out, it looks great. I chose the outfitter camo pattern and I like the subtle hues and coloration, but also personally think that unless your camo pattern of choice contains areas of stark white or royal blue, deer will have a tough time deciphering any decent camo pattern in the woods. I've already had occasion to have a deer within about 10 yards of me with no cover, but with a backdrop, and the deer never had a clue when I was wearing the outfitter camo pants and shirt, along with vest in Realtree AP grey. The pants are 6 pocket jobs, which I way prefer in hunting pants. I just love the cargo pockets for small items. The shirt is plain with collar, two patch pockets with button flaps and buttoned sleeves. All in all I'm very impressed with the style, coloration of camo and utility of these two pieces. One negative, though. It does not resist burrs as well as I'd hoped. I can also say that although I was concerned with the texture of the fabric and the blood that got on it during recent field dressing chores, it was of no concern. It all washed out easily in cold water. Their fast drying properties, colorfastness and apparent toughness traits make this some excellent stuff in my book. I'll definately buy more when needed. Rating: B+. The silent weave bibs were ordered in Realtree AP/HD and seem like a good coloration for the eastern U.S. areas where I do most of my hunting. The feel of the fabric (50/50 cotton/poly) is substantial and comfortable. The large size that I normally wear fits me well, but is just a tad short in the leg, riding up a bit to far when seated. There are snaps to close the leg opening somewhat, but not completely as a tie would do. Illustration courtesy of Cabela's, Inc. They seem to be substantial enough to withstand a good bit of wear and abuse and they will get just that, because of how much I enjoy the comfort of bibs, afield. We get a good bit of frost during our long deer season here in the Kentucky and Tennessee areas and mornings not quite cool enough for frost will give us a lot of dew. As long as your cotton/poly pants don't get too wet on your early morning walk in to your chosen stand or hunting area, no big deal. However, the old blend of cotton/poly will be a problem if it gets wet enough and chills you as you are sitting. I've cured that problem by wearing waterproof gaitors over my boots and pant bottoms. Seems to be the perfect choice to prevent your pants getting soaked to the knees before your hunt even starts. Most days when I wear these bibs, the gaitors will be added to the outfit, for the morning at least, and removed as the day warms. Six pockets below and two snapped chest pockets give you plenty of room for stuff. One downside, though. For some reason they chose to add a pass-through slit right next to the slash pockets and it's too easy to slide your hand inside the bibs rather than inside the pocket. I've already had at least a couple items slide down the leg and fall onto the ground, when I thought I was placing it into the pocket. Not a great design feature. They are not heavy enough, to add warmth nor seem to be cut large enough to fit over other clothes, so why the slits? They do have an elastic area around the back to keep the mid-section in place and also a full length, double direction zipped front, rather than button or zipper fly alone. This feature also makes it very easy to simply unzip the full length zipper to remove, rather than unsnapping at the shoulders which invariably leads to twisted shoulder straps, with all the doing/undoing. The bibs get a thumbs up from me and will get a continued workout this season. Rating: B. 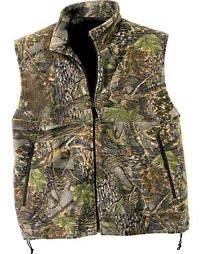 Two vests round out my new hunting clothing additions for this season. The first is a simple and functional lightweight fleece vest with full length front zipper to mock turtleneck and two zippered slash side pockets. It's just heavy enough to be useful and the sizing, for me, allows me to wear it either under or over; over a microtex or fleece shirt, or under a Gor-Tex parka, or in really cool weather, both of the above. 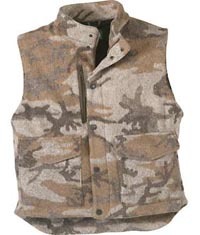 Half the reason I bought this vest was simply because of the Realtree HD/AP and the utility of wearing it over a solid colored fleece pullover shirt in the early seasons to break up that solid color and add some camoed multi-tones. Nothing special, nothing bad, simply a decent over/under vest for those "tweener" days. Rating: C.
The final item is one I'd had my eye on for a good while. The "Wooltimate" fabric is just as it sounds, part poly/fleece and part wool. Wool has become somewhat old fashioned in recent years, losing ground to the newer and lighter fleece generation. Not really a bad thing, I suppose. However, wool is perhaps still the best fabric for continuing to insulate and warm even when wet. (although that makes it heavier yet) This vest is much heavier weight than the other, and looks to be a great add-on during all sorts of cold weather scenarios. I purchased the one without "windstopper" liner feature figuring it to be teamed either over or under another piece (jacket) that would likely have Gor-tex or Dry-plus or Windstopper linings. Two large, expandable bellows pockets, two slash pockets behind them and one large zipped chest pocket (map?) give you a couple places for hands to warm, and room for stuff as well. I finally decided to chance a size "L," not knowing for certain if it would fit over a medium weight hunting jacket as well as fitting under a parka. It turned out to fit both needs perfectly. I've worn it over Cabela's lined, dry-plus, 1/2 zipper, hooded parka (quite a darn mouthfull there) and it works great adding insulation for my torso, without the added drag of additional sleeves; and excellent choice on that side. 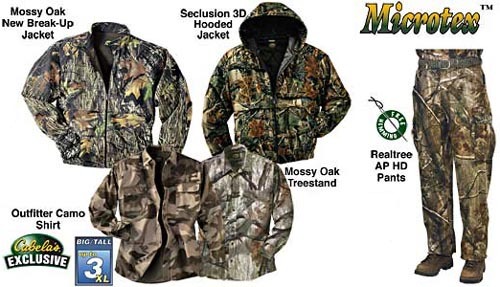 It also fits very well under my waterproof, breathable polyester, Raingurd camo jacket from Bushnell, for that added warmth on very cold or rainy days. Rating: a solid B+. I do try to spend my hard earned dollars as carefully as possible and all these items mentioned have been well worth their prices. I only ask that any item be worth the effort and cost required to aquire it . . . and all these items are! Copyright 2008, 2016 by Ed Turner and/or chuckhawks.com. All rights reserved.